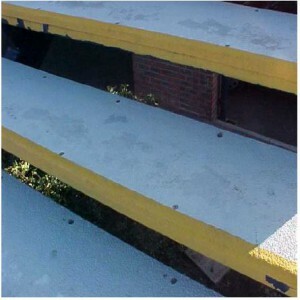 Eighteen months later, the remaining two staircases and adjacent landing areas were covered with the TreadSafe® system. Easy maintenance is a major feature of TreadSafe®. This installation is subjected to daily use and only requires washing, using a hard surface cleaner to remove any build up of dirt without damaging the abrasive coating. Motability claim that the yellow paint finish is still as bright as on the day that the TreadSafe® system was installed. In the future, Motability are planning to install TreadSafe® on a floor area that is directly in front of an intercom. The bright yellow paint finish will enable people with a visual impairment to easily locate the intercom and the door in the same way that tactile areas are placed next to traffic lights or crossing points.